This battle of orange versus white ping pong balls offers bounce after bounce of fast-paced fun. You have to pick your battles, but sometimes the key to winning them is all in the wrist. 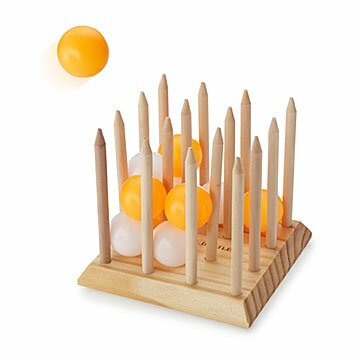 Whether it's 3D Tic-Tac-Toe or H-O-R-S-E, this set invites you to try your hand (and your luck) at a variety of ping pong play by bouncing balls into the wooden grid. Easy to learn, this showdown of orange versus white balls offers bounce after bounce of fast-paced fun and dozens of ways to battle, including Alphabet Soup, Nine Cup, Level Out, and more. It's a great game of skill and strategy for tailgating or family game nights. Made in China. Includes: (1) wood game cube, (13) white balls, (13) orange balls, (1) extra ball and instructions. Super simple concept with many fun variations - the whole family wanted to play. Definitely a hit with my 22 year old son! An alternative to the X-box for a while. Only so many ideas to think of to play it. A fun party game and perfect grab bag gift that works for any type of person. Wow. I am impressed. I love games. I especially love games that get us outdoors and having fun. I have to say this game is great. Bounce Battle is a really easy game to learn. The rules are simple. I love how it also is many games in one. You can choose a level of difficulty and just have fun. While it may be super easy to start to play, the actual skill level is hard. You need lots of hand eye coordination. It has been lots of fun watching people play this game. I wanted to send my son, who stationed in the Middle East, a game that he had not seen before. One that he could play by himself or with others. I had purchased this Bounce Battle Game as a Christmas gift for a grandson. Our family had fun with it over the holidays. My military son was not part of this & he knew nothing about this game. So I decided this would be perfect for him. Well, he let me know it was a big hit. He brought it to the base community center and others around had fun with it. He sent a picture. Thanks for an product that puts laughter in the lives of our service men & women who are separated from their families & the comforts of the USA. I wanted to send my son who is in the military & stationed in the Middle East a CARE package. I wanted to include a unique game that he had not seen or heard of. Previously, I had purchased this Bounce Battle Game as a Christmas gift for a 12 year old grandson & our family had great fun with it over the holidays. I felt this would be perfect as my son was not with us at Christmas & did not know about this game. I figured he could play this alone or with the troops he's around. Well, his exact Instagram message to me: "The ping pong game was a hit. We played it at the community center." Thank you, Uncommon Goods, for helping me in a small way help our soldiers enjoy light moments in between the often hidden but critical jobs they perform day in and day out removed from family & the comforts of home.